Samsung Galaxy S5 is now official in telco stores near you, to reach all Malaysian retailers by end of the month. As I posted about before, regarding Samsung Galaxy S5 to be officially released on telco stores today, April 11th, it was breathtaking that some loyal customers started queuing up as early as 6.30AM, because based on my post here, the first 55 customer to purchase the Samsung Galaxy S5 will be receiving a special gift which is clear now what the surprise gift is about when earlier Maxis was giving out Samsung Galaxy S5 covers worth of RM200 at Maxis Centre in KLCC, meanwhile Celcom and Digi both was giving out vouchers worth RM200 which also enables you to use it on the spot to purchase the smartphone for RM2199 instead of the RRP RM2399. 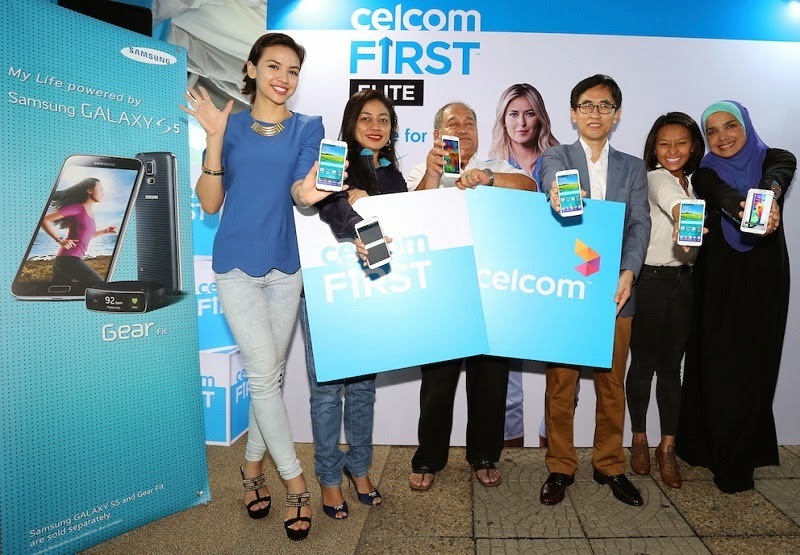 On top of that, at Celcom Blue Cube in Sunway Pyramid, Celcom surprised their first Samsung Galaxy S5 buyer with a free Samsung Galaxy S5 and Samsung Galaxy Tab 3 Lite, which means the customer Abdul Hamid bin Husin walks away with payment done only for the postpaid plan with two devices in the pocket. Awesome! With all that, Celcom organized a PWP ( purchase with purchase) for those who signed up for the Samsung Galaxy S5 plan, you would be entitled to purchase Samsung Galaxy Y Neo or Galaxy Tab 3 Lite for just RM55. Hats off to Lee Dong Yong, the President of Samsung Malaysia Electronics to personally show up and take part in the telco stores.He also mentioned that ” we decided to select 55 fans to represent the 5 core pillars of the Galaxy S5, which are fun, fit, life, speed, and style”. The Samsung Galaxy S5 is definitely one of the best phones of 2014 along side HTC One M8 and Sony Xperia Z2 which is about to release by next few weeks. The Samsung Galaxy S5 packs a 5.1” FULL HD Super AMOLED screen, 2GB or RAM and 16GB of ROM with microSD slot, Snapdragon 801 quad core processor clocked at 2.5GHz, 16MP rear camera with 4K recording and playback capability and 2MP front shooter. To keep up with latest tech and trend, the Samsung Galaxy S5 is water and dust resistant rated at IP67, and a fingerprint sensor enabled on the home button with a heart rate sensor placed below the rear camera. With most mobile phone manufacturers inventing mouth-watering smartphones, what would be your cup of tea? Would you get your hands on the all new Samsung Galaxy S5 or some other smartphone? Previous ArticleThose who pre-ordered and awaiting for the Samsung Galaxy S5, April 11th is the date you should save! Next ArticleShould we support ALCATEL in Malaysia? Place your pre-order now for the Samsung Galaxy A5 and A7 2017 and get Level U Pro worth RM399!